Arms used in Zamfara killings brought in from Libya –Zamfara Bandits Sponsor. The Nigeria Police Intelligence Response Team IRT have uncovered how terrorist groups/Bandits in Nigeria fund their organizations and procure arms from Libya to destabilize the country. 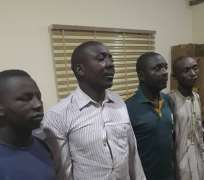 The intricate terrorist network was uncovered by a crop of detectives attached to the Inspector-General Special Intelligence Response Team (IRT) led by Deputy Commissioner of Police, DCP Abba Kyari. The police are also theorizing that arms running deals were partly the cause of the bloodbath that had enveloped Zamfara State for long. Hundreds of people have been killed within Tsafe, Zurmi, Shinkafi, Maradun, Maru and Brinin-Magaji local government areas of Zamfara State, leaving many others displaced. The terrorists’ arms running and source of funding were discovered after 12 bandits, who participated in the October 2018 kidnapping of twin sisters, Hassana and Hussaina Bala were arrested. The twin sisters were abducted in Dauran village in Zurmi Local Government Area of Zamfara State, where they went to distribute their wedding invitation. I sell for N170, 000 and 180,000, depending on the size. I receive cows weekly, and after selling them, I send money into Alhaji Naira’s account. I don’t know what Alhaji does with the money. I know the cows were stolen from their owners in Zamfara State.